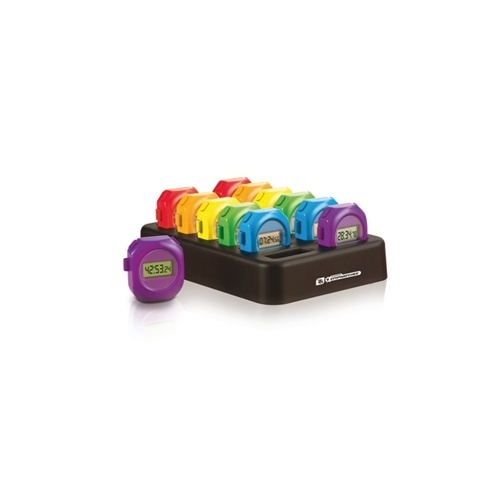 A pack of 12 brightly coloured rechargeable stopwatches and charging station. The recharging facility ensures you can stop worrying about watches having been left on and being useless when you need them most! An added feature is whereby you can set the stopwatch to show either seconds, seconds / tenths and seconds, tenths and hundredths - 3 stopwatches in one! Each stopwatch will last for approx 10 hours with moderate use before recharging and approx 20 days when on standby. The screens has a useful battery life indicator. 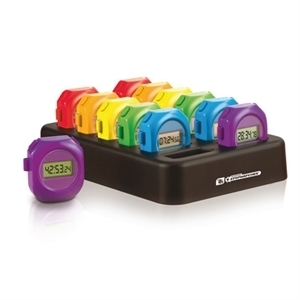 The pack contains 12 rechargeable stopwatches in bright colours, matching removable lanyards, docking station and mains adaptor - all for the price of 12 normal stopwatches - a fantastic offer.